As a newly married couples I was staying with my in-laws for few days in Pollachi (Tamil Nadu)before returning to Singapore. We used to visit Coimbatore very often as there only we can find tons of Chinese restaurant and other fast food outlets.As we were driving by Neru Stadium Road we came across this particular resturant selling these taco Bell wraps called Arabic Shawaram. 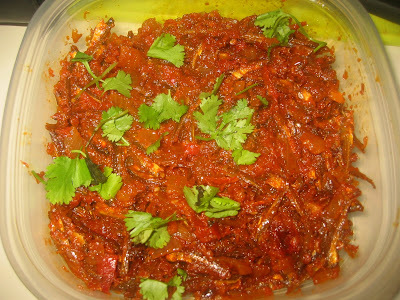 That was the first time I tasted and become my favourite dish whenever I go to Coimbatore. 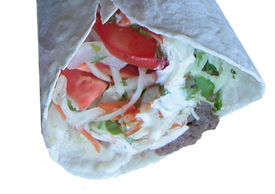 Shawarma is made by placing strips of meat or marinated chicken on a spit. Animal fat and an onion or tomato are placed at the top of the stack to provide flavoring. The meat is then roasted slowly on all sides as the spit rotates in front of or over a flame for a period of several hours. The tradition way of perpare this dish is by using tahini mixed with other vegetable but I could not find them in my place so i'm using sour cream and fresh yogurt instead...While tahini is nothing but a paste of sesame seeds.I'm also using freshly made Chappti instead of pita or hummus. Try out the recipe and enjoy a piece on a cousy evening with your loved one with a hot steming cup of coffee. Mix all the ingredients together in a large bowl and keep aside. Prepare then just 1/2 hour before assembling the shawram. Grill the marinated chicken breast at 350° for 40 minutes. Once they are tender shred to pieces and keep aside. Take a piece of chapati and spread with a spoonful of sour cream and yogurt evenly. Add couple spoonful of the vegetables in the centre of the chappati. Then add the marinated shredded chicken pieces and roll them into cylinder shape wrap. The Arabic Shawarma is ready.